Scaffold design is at the core of our business and our scaffold design drawings and calculation works are founded on many years of experience. 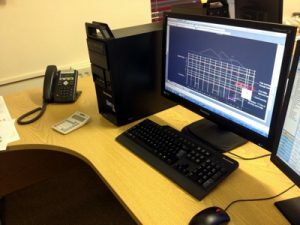 We couple this with the use of the latest CAD, frame analysis and wind loading analysis software complying with the latest codes to produce accurate and detailed design drawings and calculations for scaffolding, false work and formwork. As a professional and competent design service we are fully insured with Professional Indemnity, Public Liability and Employers Liability information members of the NASC and associate members of the Scaffolding Association. We produce scaffold design drawings in full colour, in sizes ranging from A4 to A0. The drawings can be plotted in house, or sent electronically in secure .pdf format. The designs can also be customised to show customers own branding and details.